Let’s Take a Minute to talk about retirement as a major life change. One that need not be as challenging as it so often is. The transition to retirement is one of the major stressors of life. Thus, it is a major contributor to rising world-wide rates of anxiety and depression. Mostly because few prepare for it. Especially men, who are socially conditioned to suppress, even deny, their retirement-related emotions, which often leads to chronic depression. The key to improving the transition to retirement is understanding and accepting it as both a life event and a life stage. One with blessings and benefits typically unrecognized and /or unavailable in younger adulthood. And preparing for both. Few people go on a trip without preparing. Yet we commonly expect to move into a 20+ year retirement with scant attention paid to what we will do in it, or with it, or why. Although many people prudently check their finances, too few think about much else. Especially how they expect to live in and enjoy their new life in profoundly new circumstances. There is widespread agreement that few people are prepared for the number, scope, type, and magnitude of changes retirement brings. Which goes a long way to understanding why so many find it anxiety-inducing. Particularly those whose temperament is to simply think they can just leave work on their last day, walk out, and wing it; believing they can and will “figure it out” on the fly. Empirical evidence suggests men are particularly unprepared for the new socio-economic realities that come with retirement, either as a life event or a whole new life phase: not a simple extension of what has preceded. Moreover, experience affirms men and women have different expectations of retirement, and handle its issues and challenges differently. Mostly because retirement is much more than simply not working. Most of the stress associated with retirement is due to a miss-match of expectations in this new reality. Simply put, many people typically expect retirement to be more or less a continuation of their middle age adulthood. Or a permanent vacation. It isn’t!! This misfit between expectations, based on what was and new changed circumstances, seems to be the psycho-emotional base of the anxiety and tension—even depression—that so many people associate with, and/or experience in retirement. The good news is that this mis-match can be significantly improved, relatively quickly. One way or another we were all educated and/or trained for our adult careers. But few have been similarly educated or trained for retirement. Which is why most retirement-related anxieties are significantly reduced when people make a conscious choice to make up for that deficit. Before you retire it is wise to get a broad-brush sense of the new life responsibilities, necessities, and opportunities that arise in retirement. 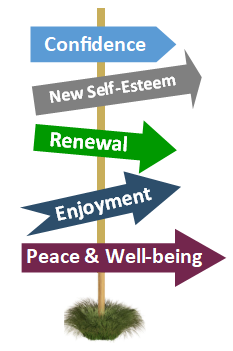 If you are already retired and find yourself feeling conflicted, anxious, or depressed in this new life phase, it is equally wise to acknowledge your angst and get help to make life better. Experience affirms that people who carefully consider their expectations, passions, and long-term goals typically enjoy a more contented and fulfilling retirement. Often this includes identifying and crafting a new sense of future based on renewed purpose, and being motivated to actively grow into it. One that provides a satisfying life-giving answer to the question, “What will motivate me to get out of bed in the morning? And what interesting thing(s) do I will I do after I get up?” For everyone this will be different. To this end, we offer a variety of workshops to help people envision and craft a life-enriching vision of their retirement and begin to make a successful transition to it. We also offer private coaching for those dealing with particular issues and challenges. Most of which have roots in their family of origin. In addition, we offer a free, no obligation, 30-minute consultation to those who wish to privately assess their retirement issues. Click here to request your appointment. Together, our programs are based on various integrated facets of our sense of Conscious Aging as a Spiritual Practice (CASP). We have helped many hundreds of people using this approach in a variety of settings to improve their experience of retirement and age well. It is a well received amalgam of psycho-spiritual coaching, pragmatic socio-economic considerations, and spiritual companionship. Check out our website and see for yourself if it can help you too.